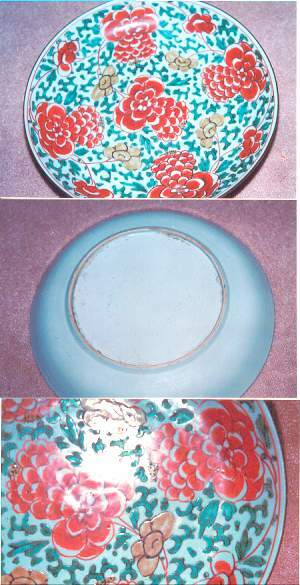 I have attached some pics of a three color plate (bowl) which I have been told is 18th century possibly Kangxi. The plate is very nicely (thinly) potted with overglaze enamel decoration and has a brown rim. The color in the photos is more blue than the plate really is. The color of the white glaze is actually very light blue grayish white. Could you give me your opinion regarding possible period? I find the date "18th century possibly Kangxi" correct, even if I personally would have put it as "Kangxi/early 18th century". It should normally be no doubts about this being a Kangxi period piece, since the brown rim and the "Famille Verte" or maybe rather simplified wucai decoration are typical of the period, and the dish and its decoration are - I would say - well known. The decoration could have merited an even earlier date than this and not many would have argued against a late Transitional date, or slightly before 1680. Then again, it could have been made as late as the 1740s, especially if we would consider the possibility of this being a Fujian piece rather then a Jingdezhen. What we are left with is a general feeling for what is the most reasonable assumption. As such I prefer the "early 18th century" date because of the shape of the porcelain dish - which is early Western export style, and the fact that the dish does not have any decoration under the rim, which it really should have had if it was to be typical of the Kangxi or earlier, period.